Portable Room Dividers and Screens for hospitals, doctor's surgeries, dentists, and pharmacies. Manufactured in the USA using premium materials. 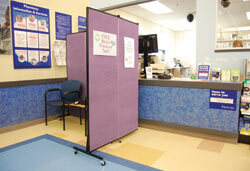 Home and industry healthcare temporary room dividers are easy to use and perfect to create patient privacy. Healthflex Privacy Screens provide privacy in a variety of settings including in the doctor's office, dental facility, pharmacy, physical therapy room, health clinic, hospital, school nurse's office, nursing home, or in emergency relief centres. Each panel of the unit is also treated with a factory applied antimicrobial coating to prevent the spread of germs. Due to so many of these screens being used in the health care industry the Heath flexscreens come with a antimicrobial coating to prevent the spread of germs. These screens are highly versatile and extremely portable making this screen useful in many situations from private screenings to barriers to entry. A divider will help you create a quieter environment. The honeycomb core dampens the noise that may otherwise be distressing, blocking upto 65% of sound. Room divider screens are sound-absorbing, blocking up to 65% of noise from the other side.